In Asiacrypt 2003, the concept of universal designated verifier signature (UDVS) was introduced by Steinfeld, Bull, Wang and Pieprzyk. In the new paradigm, any signature holder (not necessarily the signer) can designate the publicly verifiable signature to any desired designated verifier (using the verifier’s public key), such that only the designated verifier can believe that the signature holder does have a valid publicly verifiable signature, and hence, believes that the signer has signed the message. Any other third party cannot believe this fact because this verifier can use his secret key to create a valid UDVS which is designated to himself. In ACNS 2005, Zhang, Furukawa and Imai proposed the first UDVS scheme without random oracles. 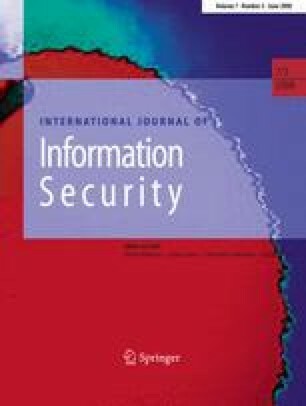 In this paper, we give a security analysis to the scheme of Zhang et al. and propose a novel UDVS scheme without random oracles based on Waters’ signature scheme, and prove that our scheme is secure under the Gap Bilinear Diffie Hellman assumption.